I had heard about Uber a long time ago but was pretty skeptical about using their services because their app is expected to be connected to my bank account via my master card. Tbh, any type of external connection to my account makes me scared. But my friends encouraged me to embrace the cashless Naija theme, so I downloaded the Uber app which is available on apple and google app stores. I desperately needed a cab, so I decided to fill in my details and use Uber. Basically, the app shows you the available cab driver and details (name/picture/phone number), the plate number/car model (Uber cars are typically 2008 models and upwards), and the approximate pick up time. A fare estimate can also be requested prior to requesting a cab. The app is “map like” and shows directions from pick up point to destination. After requesting a cab, I got a call from the driver confirming my location and his arrival time. In less than 10 minutes, he was in front of my dorm. Once I got into the car and we started moving, the driver began the trip. My cab was a 2009 Toyota Corolla and the driver was Abiodun. He was a cheerful polite guy who spoke a lot; I got tired of him talking so much. He was careful and didn’t drive like the normal Lagos drivers. I got to my destination in less than an hour, he ended the trip, and my bill was sent and deducted from my account. A rating poll was also available for me to rate my driver. This was much better than the first mainly because the driver was so quiet and there was no awkward conversation. Tbh, Uber pricing is almost similar to the rugged yellow cabs. 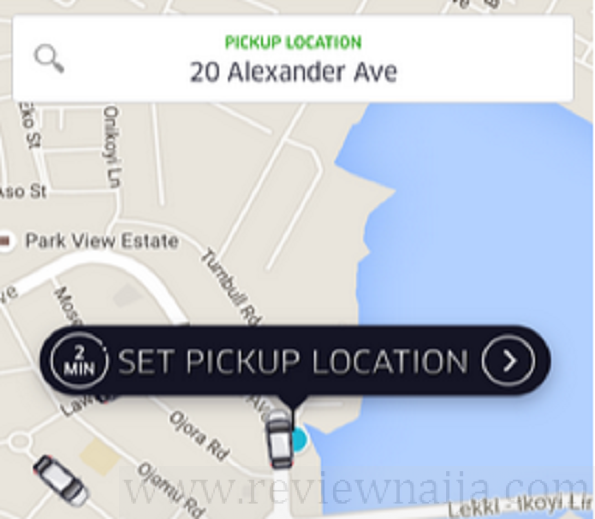 Surulere to Lekki is roughly 3000 NGN with normal cabs but cost 2600 NGN + AC with Uber. I rate Uber a steady 9/10. I was really skeptical at first, but it’s beautiful when you don’t have to haggle cab fares. I rode with a driver named Osahon John yesterday and forgot my phone in the Uber taxi. I managed to reach him via the contact the driver link on the online portal. My greatest shocker my phone might have grown wings. Wow!!! 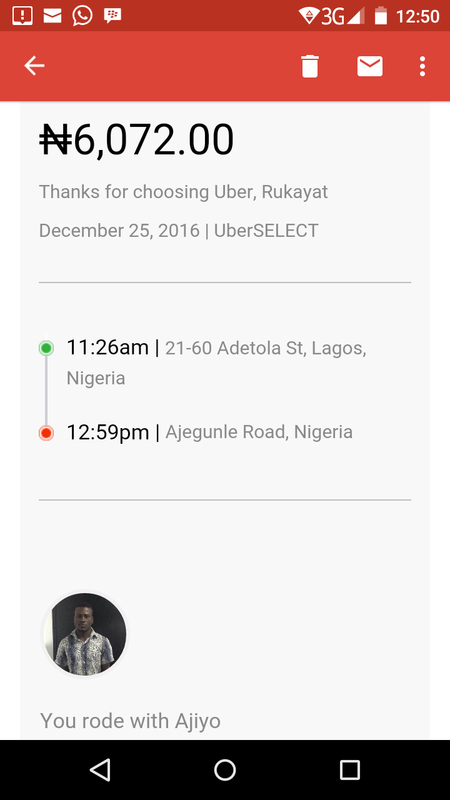 I have tweeted to Uber support but them kuku no send as they are not responding. So this is a major deal breaker for me. Ever since its arrival into the Nigerian transportation scene its been quite helpful but they do need to work on their customer service. The uber drivers tend to be extremely rude for no reason, some even leave the car untidy showing they have no regard for you. Regardless its a good service that is here to stay and it has helped with night movements which have become easier and safer. I always use Ubar since they started and never had a problem , but on the 7th of January 2017 l had a very bad experience and no number to contact, sent mails to their so call email up until now no response. In the state you call for Ubar and the driver cancelled the trip you won’t be charged and in Nigeria where most of us are highly untrusted. I had a good first time experience with Uber but my second experience has changed my perception about their charges. Apparently, they charge higher compared to the Yellow taxi. on the 25th of December, i decided to take Uber from Surulere to Ikorodu to see my folks;ignoring the plea from a yellow taxi driver to board his car at a charge of #4000 . Surprisingly, the road was unexpectedly free, even for a Sunday morning…but then, i realised people had gone to church to celebrate xmas…when we got to my folks place , the Uber driver ended the trip and behold..a charge of #6000. for what?? Honestly, i was stunned. It was as if the earth should swallow me. anyway, i paid the driver reluctantly sha. On getting to work on th 28th, i practically told everyone i knew who had encouraged me to use Uber of my experience.. Guess what they said?! Ah, you shouldn’t have taken Uber to a far destination. Its best for close by areas…. can u imagine that?! Today, i am currently surfing the net for a better , cheaper and safe taxi. Sorry boo, but was there a surge ?? I normally advice you check the fare estimate before heading out. Kindly note that am very dissatisfied and disappointed with your request on me paying an owed amount which I won’t grant. I requested for your service, just for your driver to keep me on the road under the sun and with poor health for an hour looking for an address that was very obvious even to a blind man. Even at that he was very rude to me. Kindly note that this driver that is carrying me now, will only get the amount due for this trip and nothing more. Uber didn’t pay for my medical as a result of my challenge the day I was left on the road by an Uber driver. I recently took an uber ride and the charges were much and exorbitant. 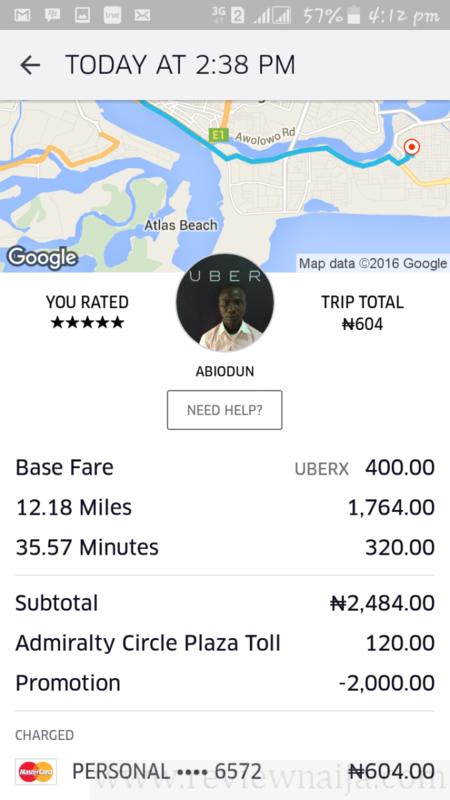 How can I take an uber from Lagos island to Ikorodu and be charged #4200 and there was no surge nor holdup at all. How come it’s that expensive? As much as I love taking uber this has disoriented me. That sounds like a lot! Did you get an estimate before your trip started? If yes, and the estimate was smaller than the actual amount, then you should complain to uber. They are usually very responsive. Also, not sure you’ve heard of Taxify but I used them the other day and had a splendid expereince! I used uber service to go pick up my car,just yesterday. I’m not sure I understand the problem here but give Uber a call or send an e-mail. They are usually very responsive. Mine is a complaint. I’ve been using uber but I got disappointed this morning. The uber driver cancelled my trip after keeping me waiting for almost 45 minutes and I was debited 1000. Can this be rectified asap? We are so sorry to hear this. I would advice you send a message to the Uber team via Twitter or via mail, or you could use the help option on the app. Hope this helps. About some months ago I heard uber and as usual I thought it would be some expensive stuff. I had an outing coming up with my girlfriend and since I didn’t have a car yet but wanted something private I decided to get a cab. Being the adventurous internet freak, I checked out all corporate taxis in lagos state ,seeking price estimates for comparison. They were all high till I checked out uber. So I registered and I was ready. Saturday I was ready after entering the location I requested for an uberX, I was given the drivers contact and within minutes the driver was at my location. Infact, the ride was smooth and gentle, the driver was social and respected our privacy. After the drop off, I just had to rate him 5 – star☺. After the outting, I requested another uber ride, I was given a driver and his contact info as usual (including the vehicle plate number) and within seconds I discover that I saw the number plate on a car that just passed and I was like ? is that the ride? It was an awesome Toyota corolla, when we got in, wow! It was the bomb, this driver was even better. Uber is doing great and to be honest, the price is very cheap compared to a normal taxi, red cab charged me 4500, uber charged me 3400, amazing right? Yeah, just as I thought too. So guys I’m not advertising them, I’m just expressing how dazzled I was. I was so impressed, the ride was definitely worth more than I paid for considering the comfort. I just recently discovered Uber, thing is your review gave me the go ahead to try them out and I have. I had a business meeting at Lekki on a Sunday and I invited a few friends along for the meeting so the onus was on me to provide transportation for them. 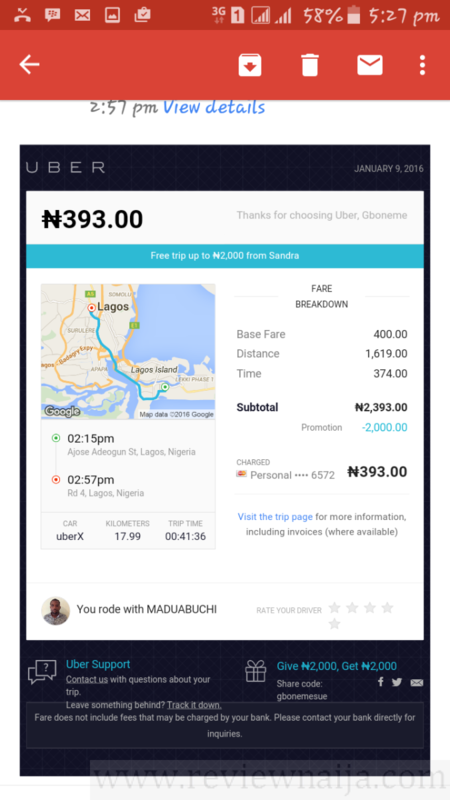 A friend advised using Uber as he had rode in one of their cabs once but I was discouraged by the fact that whenever I saw uber stuffs anywhere I would always see ‘2k off’ , ‘3k off’ etc and I always wondered where I would be going that they would give me that much off my cab fare. Then I remembered that I had gotten a message from MTN earlier during the week that had a code in it. I headed to AppStore and downloaded the app and created my profile and upon inputing the code I was told that I had 2 free rides worth 3000 naira each. I did the quick maths in my head and I decided that Lekki shouldn’t be more than 5000 total which would mean I would just pay 2k. That was fair enough for me. I ordered for a cab and I called him and he said he would get to me in 10 mins. After waiting for like 25 or so minutes he called me, he couldn’t get the address I told him to come meet me at,In another 2 minutes we were able to locate ourselves. The cab was a 2013 or so Corolla , very clean and I sat and the driver courteously asked me if he could start the trip and I said yes of course . I went on to tell him that that was my first time in using Uber and he went on to enlighten me about Uber and how it was much better than conventional yellow Cabs and about how convenient it was for him as a person we chatted all the way to Lekki at the end of the trip, he stopped his ‘meter’ and I also checked my app and zero naira had been deducted. He explained to me that that meant that my cab fare was less than the 3k voucher I got. Moments later I got an email that my cab fare was 2600 and there was a breakdown of everything. On my way back I ordered another Uber and this time the Car was a KIA Sportage and the driver was just as courteous but not as chatty as the first driver. Zero naira was also deducted for my return trip and the email voucher put my cab fare at 2800. So there goes my 2 free ride courtesy of Uber and MTN . Overall I was really marveled by the Courtesy on the part of the drivers and I can’t think of any complaint about the service yet. The downside to the uber experience is Traffic, because the longer the ride, the more you pay so I will recommend it for only when you are going out at a time when you are sure that traffic will be light or non existent or when you want to arrive at that Owanbe in style. One thing is certain, I am definitely riding Uber again and soon. P.S. YOU GET TO RATE THE DRIVERS UP TO 5 stars based on their performance. I rated my drivers 5 stars each. Thanks for the review, Bolu! yess! one of my drivers showed me my rating and Im on a steady 5 stars. *blushing* Im such a good person. We love Uber, as we don’t drive it’ a lifesaver and at least we know we are not being cheated. One time we paid a cab guy 5000 from Ikeja to Gbagada #NeverAgain. What we love most is convenience & comfort. Have you noticed how there is a problem with the app recently. I like Uber, its relatively cheap compared to others like Afro Cab. Afro cab is silly. Haven’t used them , but requesting for them is a big issue. Lol @comment. I would try it…a friend gave a similar testimony(it’s thanksgiving sunday) of their service last week..now that you’ve reviewed them..we are a go. So I recently used UBER again and this time, my driver was literally toasting me!. it was awkward. I’ve had only good experiences with them too but I prefer using them when i’m on the Island cos of better road maps. Xo!